Small crossover extends Audi’s product range. Audi’s product expansion continues, its latest vehicle a compact crossover utility vehicle designed to serve as another gateway model to the brand. 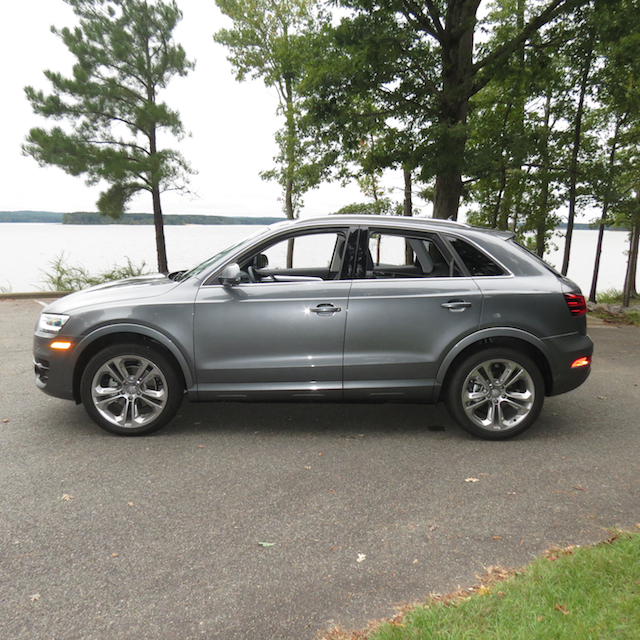 The 2015 Audi Q3 joins larger Q5 and Q7 crossovers, and is itself a five-passenger vehicle retailing from $32,500. The Q3’s competitive price point, generous standard equipment and its expected Audi refinement should ensure this model’s success. 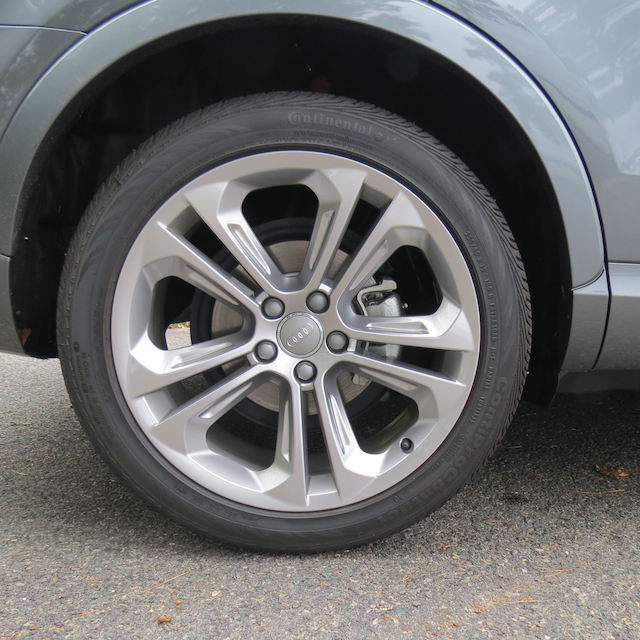 Our weekly driver was a Audi Q3 Premium Plus, quattro ($34,600), one of four editions available. 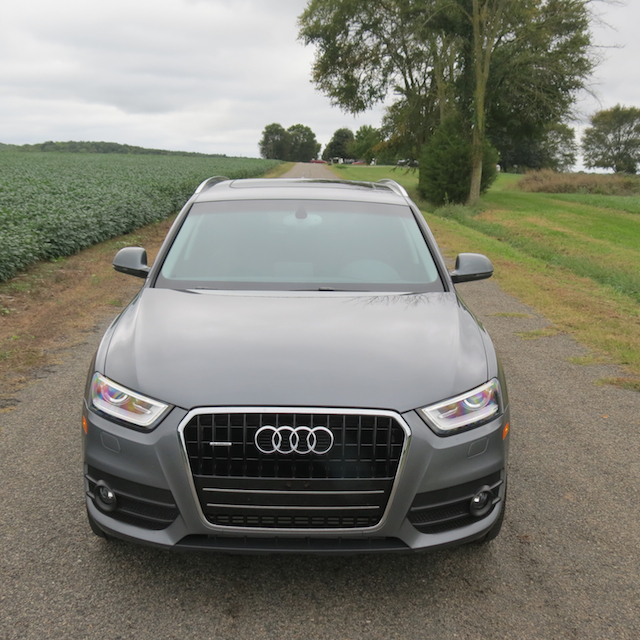 The base Premium Plus and Prestige ($36,400) front-wheel drive models as well as a Prestige, quattro edition ($38,500) can also be had. Quattro is Audi’s all-wheel drive system; all models carry an additional $925 delivery charge. The Audi Q3, although new to North America, has been sold in Europe for the past few years. It shares its platform with the outgoing Volkswagen Golf, but don’t allow that to alarm you: this model combines Audi refinement with a very good drive within a skin of its own. That skin, by the way, includes the expected Audi face with its bold grille, Xenon plus headlamps and signature LED daytime running lamps. Those headlamps are standard across the model line, what serve to cast a brighter and wider angle of light as you drive. I’ve become a fan of such advanced lighting systems especially when I navigate dark country roads and want to spot deer before they make their suicide run across my path. The Q3 offers a firm stance and is marked by what Audi calls a “coupe-like” design. I can’t agree with Audi on this point — although the roof does slope back slightly, it doesn’t have the same dramatic flair of another Volkswagen Group product, namely the VW CC. What it does have are distinctive, sporty wraparound LED tail lamps and reflector lamps. Its dual exhaust tips are placed together and located on the driver’s side of the vehicle. This vehicle also comes equipped with standard roof rails, a tail gate spoiler in addition to front and rear fog lamps. Inside, you have a compact cabin that avoids the clutter in typical Audi fashion. LED interior lighting is standard and you get other amenities with every Q3 model such as: keyless ignition, leather seats, a 12-way power driver’s seat, heated front seats, a three-spoke tilt and telescopic steering wheel, dual zone climate control, automatic wipers, a panoramic sunroof with sunshade, power accessories, automatic wipers, cruise control and eight drink holders. Audi outfits the Q3 with a 10-speaker sound system, a CD player, MP3 playback, a music interface, Bluetooth connectivity and an SD card slot. What it doesn’t offer is a USB port — instead, if you have the right smart phone you may be able to connect with one of the provided cables. In my own eyes I had the “right” phone, but the proper connection was not provided. It is time for Audi to make connectivity points that make sense! 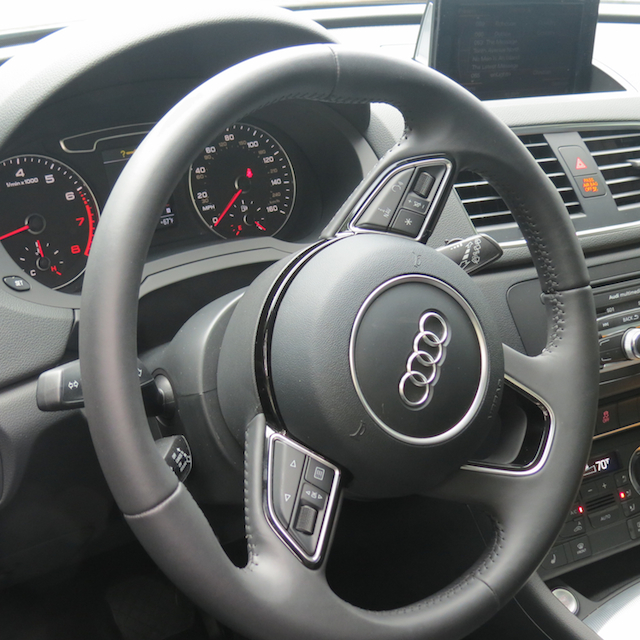 An advanced voice-controlled navigation system is a $1,900 upgrade with the Audi Q3. It includes high-definition radio, a CD/DVD player and a color information display. Unlike other Audis, this one is fixed in place. It does not emerge from the dashboard and it cannot disappear out of view. Those “deficiencies” may be attributed to the dashboard’s small size. The Q3’s instrument panel features analog tachometer and speedometer displays that flank a digital driver’s information system. The center stack is arranged from top to bottom as follows: navigation screen, vents, audio system, traction control and hill descent switches, climate control and a slot to hold your smartphone. The transmission shifter is placed just before the cup holders, parking brake and a 12-volt outlet. A small, covered storage compartment doubles as an armrest. 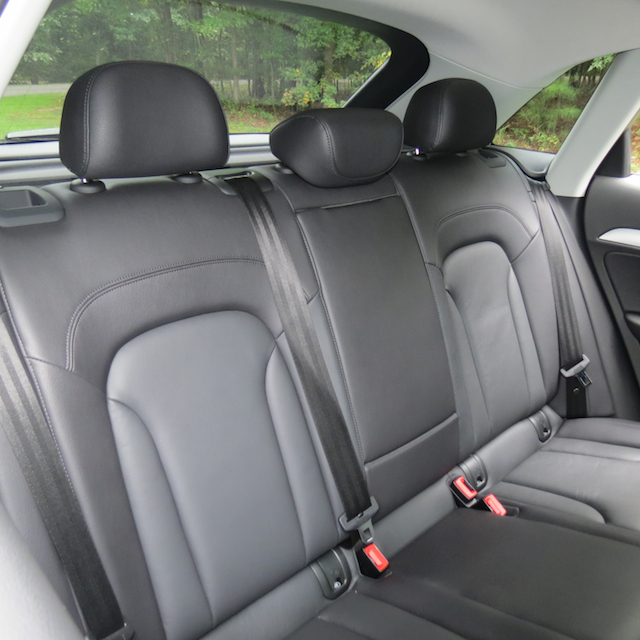 Although there are three seat belts in the rear seat, you’d be hard pressed to squeeze more than two people back there. This becomes especially challenging if one of those outboard seats is reserved for a car seat as the seat would infringe upon the middle position. It would be better to have the center arm rest folded down and the cup holders opened to make good use of that position. 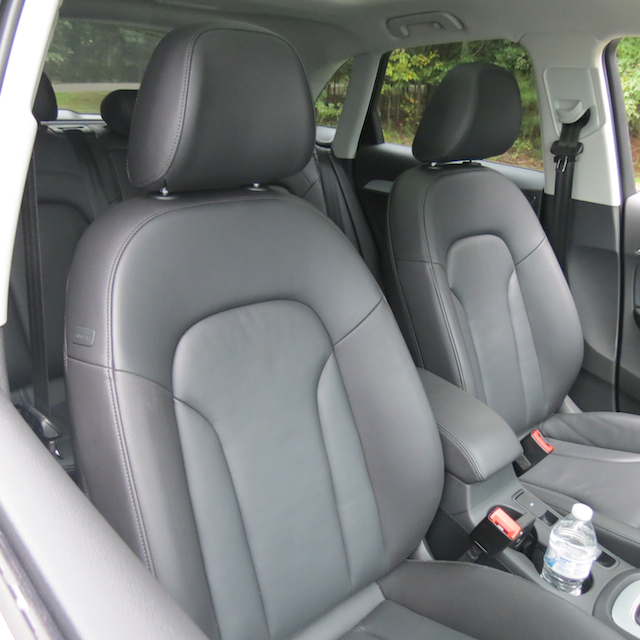 The Audi Q3 will likely interest upwardly mobile 20-something individuals and couples — you can keep the crossover when you have your first child, but the small rear storage compartment (16.7 cubic feet) will limit the amount of kiddie stuff you can bring with you unless you fold down part of the rear seat. Fold down the entire rear seat and your storage capacity nearly triples. Say “crossover” to most any car buyer and they’ll expect the usual high-profile, family-tamed model. 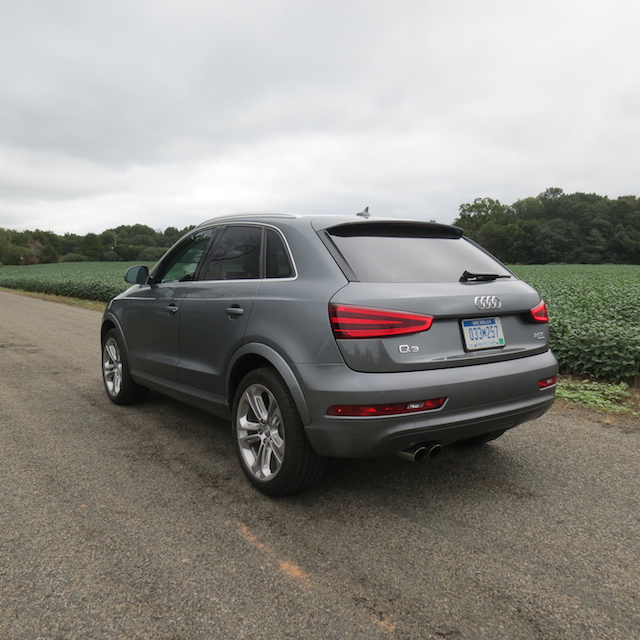 Fortunately in the Audi Q3 we have a vehicle that rides and drives closer to a sedan than to a utility vehicle. That is, if you select one with quattro all-wheel drive. The Q3’s composure and agility will have you smiling. You can fully appreciate its capabilities by tackling curvy roads, especially on hillier terrain where the pavement rises and falls. Quattro’s exceptional grip imbues confidence as power is delivered to where it is most needed. Try finding that in any front-wheel drive crossover and you won’t. Even most other systems just don’t match what Audi delivers. By now, you can tell that I routinely urge people to take the all-wheel drive option when it is available with most any front-wheel drive model. Especially when selecting an Audi. The fun can be ramped up by turning off traction control as you weave your way on the road. Step on the accelerator and the turbo four is quickly activated, serving up a brisk start that continually delivers power as you push up to highway speeds and beyond. Passing is easy too — there is no lack of power as you push down the road. Currently, there is no diesel option available with the Audi Q3. It seems likely, though, that the 2.0-liter turbo diesel found elsewhere, as in the A3, will eventually be made available. That would be good news as the Audi Q3 gasoline edition is rated 20 mpg in the city and 28 mpg on the highway and takes premium fuel. An estimated 35 percent boost in fuel economy would help the Q3 shine, particularly in a fast growing segment. 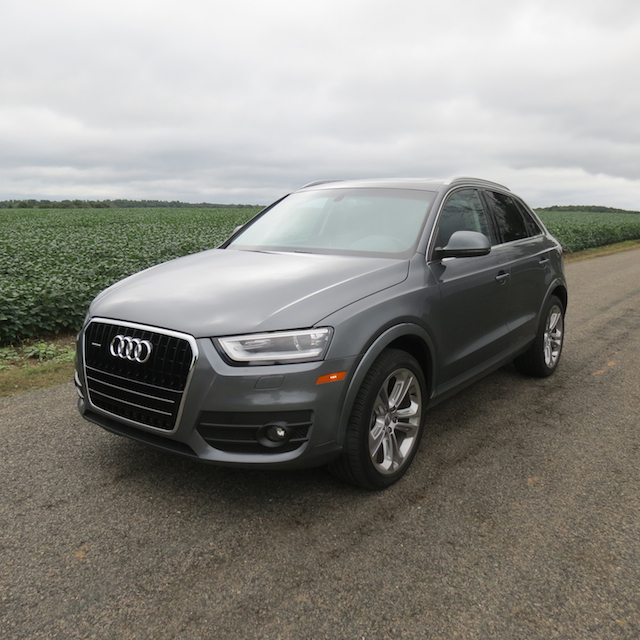 The Audi Q3 has several competitors that you will want to cross shop. These include: the BMW X1, Lincoln MKC, Volvo XC60 and the Mercedes-Benz GLA-Class. If the luxury label isn’t important to you, then the Subaru Forester, Buick Encore and the Volkswagen Tiguan might also be considered. Wouldn’t You Really Rather Have a Buick (Lacrosse)? 2015 Audi Q3 2.0T photos copyright Auto Trends Magazine. All rights reserved.